Hello and welcome to another edition of Me Talking. So it’s the weekend! 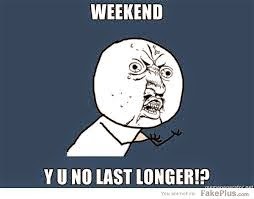 I have a love hate relationship with the weekend. There are some Friday nights where I just want to be alone away from most people and there are those Fridays where I want to go out and just talk. Do you guys ever feel that way? Yesterday I came home feeling sort of out of it. I felt as if I wasn’t really thinking. I was moving, eating, and working, but I felt like I was just doing those things and not really putting much thought into them. It’s sort of humorous to feel that way because no one else recognizes it. While feeling this way, I like to think what causes me to be this way? Is it laziness? Fear? I can’t stay in this phase long enough to actually figure it out for one reason or another, but the questions still remain. I like to think that I’m just recovering from the week. We all need a little time to just stop living and observe.